Technology is a game changer for the dentistry industry. Check out the range of new tools we have available to enhance your experience and treatment results! CEREC dentistry allows you to get a porcelain crown, veneer or filling in just one convenient appointment. The procedure takes only about an hour. 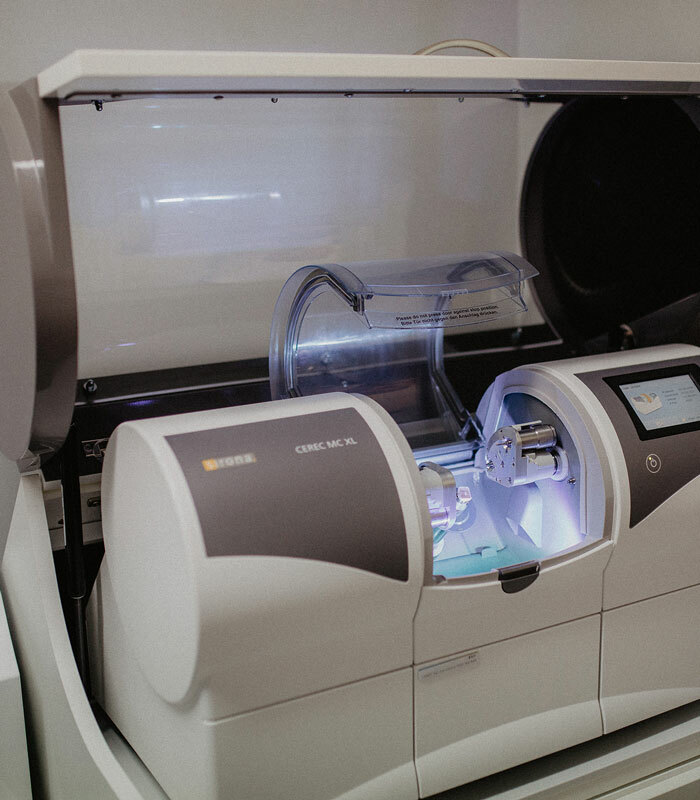 Using the CEREC system, we can make you a crown, veneer or inlay in as little as one hour – where a regular lab visit would take up to two weeks. Instead of making a tooth impression with putty, we’ll take a digital scan using a special CEREC camera. We’ll convert that image into a 3D computerised model of your tooth, and use that to create your brand new tooth. You might have some not-so-fond dentist memories with the piercing sound of a traditional dental drill. But with the Waterlase™ Dental Laser, those will be replaced with some much quieter procedure experiences. The Waterlase™ doesn’t vibrate, create heat, or even come into contact with your teeth and gums. During your treatment, you’ll now hear a soft popping sound. We’re ready for you to experience how gentle and comfortable your procedure can be. We have a soft tissue diode laser as well as a hard tissue Waterlase. Conventional surgery for hard and soft tissue used to require plenty of visits and long healing times. Our laser technology has removed these issues. Its gentle touch and pinpoint accuracy means less bleeding, less discomfort and faster healing times. We can now perform gum contouring, treat periodontal disease, filing procedures, and other treatments with ease. We have an intraoral camera in every surgery so that you can see precicely what your dentist sees. An intraoral camera is a small video camera that can X-ray the areas of your mouth that are harder to see. Through a large external monitor view, we will insert the camera into your mouth and gently shift it around to get accurate images at awkward angles. This technology is used during restoration procedures and takes snapshots during treatment for detailed before-and-after photos. With digital dental X-rays, we can use pictures of the teeth, bones, and soft tissues around them to help find problems throughout your mouth. They show cavities, hidden teeth, and bone loss that can’t be seen with just our eyes. Digital X-rays use a small sensor unit that sends images to our computers for recording, analysis and saving. We use the digital copy to explain how we can improve your oral health visually.